I can log in when I access my account online but not from this App. I have a brand new 2018 iPad. What’s up Taste of home!!! I installed this app, but was only able to download the current issue. I went to FAQ and followed the instructions, but no it did not restore my previous purchases. I called customer service and was told that I would NOT be able to restore my past issues because my free 6 months starts with the issue that is current when I installed the app. I am so angry with Taste of Home! I will not be renewing my subscription. In addition, they told me that they will charge current subscribers $10.00 a year after 6 months for the IPAD app. Only gave it one star because it would not allow me to give it negative stars! I really love this iPad edition of Taste of Home. It's slick, easy to access, and, of course, full of recipes that are for the cook who likes to cook with basic ingredients! I love taste of home magazine and was excited to get the digital copy. I do not currently subscribe to the paper issue. Once I downloaded the app I chose to be a monthly subscriber through iTunes. I get charged monthly and I can not sign in to receive new issue. I tried to call the " digital help " number they give, they said I had to call iTunes, I called iTunes , she gave me a " one time only" refund and I'm still in this terrible cycle, well see how next month goes. Bad customer service. Guess you were not kidding abut those six free months for print subscribers. Just like Hearst publication. I will not be pressured into giving up my paper subscriptions. Conde Nast got it right. I have subscribed to most of their magazines because they offer the digital subscription as a bonus. I'll stick with the paper. I am having the same issues as other reviewers, won't authenticate and runs you in circles verifying. I can't log in anymore and I know the account worked this morning. I went on my computer to make sure I was using correct username. TOH is offering an additional 6 months if you convert your print subscription to digital only. What a JOKE! Installed the app and could not view the mag. Totally misleading. I enjoyed this magazine until suddenly, one of my issues was no longer there and and only gave me the option to purchase it. After months and months of emails, they eventually told me they couldn't do anything for me and washed their hands of me. I tried contacting iTunes but they told me that they couldn't help, either, and that Taste of Home only has access to fix this. Don't subscribe to this magazine because if you get a problem, they won't give you a solution. Here is a part of their email to me: "I see that in the past months our agents have tried to assist you in your issue with viewing Taste of Home on your iPad. I apologize but we have no more options to suggest to you. The digital purchase you made was not directly through Taste of Home, so we have no visibility to your account. You will need to contact the customer care at the iTunes store, since your purchase was made through them." I paid for a year of magazines on my iPad. Where is the June/July issue. Where do i find my account number for customer service? The popup on Pinterest makes it sound like you get at least one free issue if ou own load, but you don't get ant Thing except how to make a rice krispie snowman. Then they hit you up for at least $3.99 to do anything. I like having the magazine on my tablet, but it is hard trying to find everything in the magazine. It also takes several a temps to get it to upload. I am still trying to get issue June/July to upload. Just downloaded to my iPad and love it. The pictures are amazing and I had no problems get my account set up with my current print subscription Love the action in some of the pages. The clarity of the pages are truly amazing. Looking forward to next issue. I love this magazine, I thought I would love this app. But I hate having to turn the iPad in order to view it. I love my iPad and love the landscape view, I wish this app was in landscape. This app was great for a while and now you can't even get in to view it. Something needs to be fixed!! This is terrible, please fix! I installed the app and it won't appear. I then go to the app store and it says it's installed. I press app support and I go around and around in a loop, logging in and going back to sign up page. I am already a mail subscriber and I hope this doesn't mess things up by not sending me my magazine and making it digital which would be ok if I could only pull up the app. There have been many complaints why isn't this fixed? I don't care for the fact that I have a paper paid subscription and that I now am expected to pay for the iPad version. Waste of my money to have to pay twice for the same information. I like the fact that I don't have to have magazines cluttering up my house, but I think that the new magazine should automatically download with updates. I should not have to intentionally look for it to download it. I really like the app. It's nice to not feel like I must save every issue. It's easy to use. I don't like that I need to enter my account number every time I want to download the new issue. When are we getting "Simple and Delicious"? Please fix I can't download my December issue. So much got my back issues back, but now the app seems to crash a lot. One you can actually use! I downloaded the app, but there's no icon on my desktop. Forced to AppStore every time to launch. Needs work. I thought it would be more like looking at a real magazine. Takes too long to download, unless I'm doing something wrong. I would rather have the actual magazine if this is how it works. Very disappointed! I love the recipes compiled in this magazine and the many cook books under the taste of home label. I have been getting issues of this magazine for several months and have been very pleased with the digital format and interactive capabilities of each issue, especially being able to save recipes with the click of a button. I was very disappointed to see that the December issue is not interactive at all. It seems to just be scanned images of the print version, which is hard to read and useless for saving recipes. I hope you will go back to the previous format but for now I will not be purchasing any more issues. I have so much trouble with this app. I try to open it and my log in is gone. After I finally get it to work half of my purchases have prices by them and I can't open them. I've tried reinstalling and still my purchases have prices on them. Big disappointment. This happens just about every time I try to read my magazines. I've had this app for a long time and at first I didn't have this much trouble. Don't know what happened. I paid for a year subscription and only received two issues! Do not buy this with a gift card! They don't tell you that the magazine will NOT authorize it! If I could navigate the darn thing to actually read the stories and receipts this app would rock. Used to get it mailed and hated to store everything. Now I'm paying for a subscription I can't really benefit from. Certain pages say tap for recipe you tap and get absolutely no place. Fix the app. Please make this interface friendlier. Awesome pics! Also would be better if there was a way to file favorites, bookmark them and send shopping list of ingredients to email If this doesn't already exist. I don't understand why the app makes me pay for electronic magazines, when I already subscribe to the print version of the magazine. There is no additional cost to the company to make the magazine available electronically. They don't even offer a discounted price. I was hoping the app would provide a better search engine, similar to the website and not just being able to flip through an electronic version of the magazine. I love Taste of Home magazine, but this app is really horrible. Wish I knew where to find the latest magazine! The latest issue I see is June/July2013. Irritating to say the least. I purchased a 1 year subscription in December and since then the December issue is the only issue that is available. I know there is a current issue out in the stores, however, it is not made available in the app. I am very frustrated since I have been charged the 1 year subscription. I bought subscription from ITunes and got logged out. I can't download current issues because it will not allow me to log back in using ITunes account. I would think that the August issue would be out by the first. It is the eleventh and still no issue. Been receiving print version. Reads beautifully on IPad . However, downloads really slow. Be patient! I love this mag and I use recipes from it at least once per week. Horrible layout and navigation. Please hire a UI designer to get it right. I called customer service and was told there is no January issue but the Feb/Mar issue will be out January 30th. Fantastic app with great recipes! I've really enjoyed the Taste of Home app. I love the easy accessibility of the recipes. All my magazines are in one place. No piles of back issues! Very easy to navigate through the magazine. I can't find where to sign in after I've downloaded....help please! I love this app, but please push down the app whenever it comes in! I have spent so much money with this company, but obviously it's never enough for them! Thought I would try this out as a way to save some space, and for convenience, and they just want more and more money! Do you remember when this magazine was first available? It was very good and very reasonable, but just like everything in this country, it's become more available for the "Haves" than the "Have Nots," so if you have the the money, God bless you; I don't. I'm retired on social security. And with ANYTHING-you-would-ever-want-to-cook being available online for FREE, who needs it? So much for "Taste of Home"... I want a "Taste of Yesterday!" I used Bing search engine to locate a recipe for chicken pot. All I got was an app with buy buy buy. Could not find a recipe for a mud pie. I'm going to remove it from my iPad. We use this app for 2-3 meals per month. Great buy! Always loved the magazine but reading it through here is cool because it makes it so easy to save the recipes or send them to a friend who I think will like it. I can't find the log in to use this app. I have my account no/user name and PW, but am frustrated trying to use it. 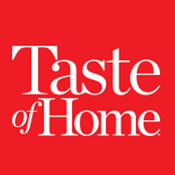 I have subscribed to Taste of Home for 15 years and I I'd've the magazine. I am thrilled it is now available as an app. Have always loved this magazine but I love this app more. I do wish there was a way to save the recipes without emailing them to myself. have used taste if home for years as a book now an app.. keep it coming. I like the fact that I don't have paper cluttering up my hoise, if I want paper I kist print the recipes I want. But this allows me to jave what I want on hand. Very nice. So happy that magazine is available for my iPad. We travel so much for work and play, I could never keep up with my favorite magazines and wonderful cook mags., but now my library goes with me wherever I go. Does take a little longer than I like to download BUT the wait is worth it. When I subscribed to a magazine half the time they could not catchup with me, problem is solved. Thanks, see if you can work on downloads and to be able to bookmark if we wish, some also have it where we can crop an article or recipe. Love this app. No more piles of magazines. I have to admit though, it is hard to navigate, but catching on. Too difficult to either print specific recipes or entire page. Indirect method requires either emailing the desired item to yourself and printing it out or using a scanner to scan the tablet page and then printing. Neither method is better than just printing a copy of the magazine page. I keep having issues with logging in. It keeps saying cannot be authenticated!!! Since the update, it seems that the print is extremely small. I am unable to read it and there is no ability to expand the screen. Completely useless to me. The recipes are great however the app suffers from a few drawbacks. It is difficult to easily return to where you were reading if you go to a different recipe section - say from the bottom of a page. I hate either having to go back to the beginning or slowly hunt through the articles to find my place. Additionally there is no way make sure you have covered all the articles/materials because you can skip around a lot - unless you do a slow page by page both horizontal and vertical scroll for each page. Lastly, there is no way to print a recipe from the app unless you mail it to yourself. I'm paying for the darned thing, why can't I print it since I can't cut it out of the magazine? I have not received my January issue on my iPad? I purchased a year and you took my money. Is there a problem? Pretty bad. No recipe box. No bookmarks. Nothing.